Welcome to the Formula 1 Grand Prix De Monaco. 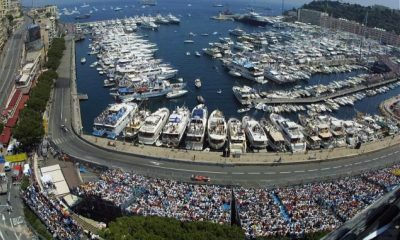 If you can only make it to only one motor sport event in your lifetime then it has to be Monaco. From Casino Square to the World's most famous Hairpin, through the tunnel and past the luxurious yachts, Monte Carlo is a circuit of legendary corners full of history. The tight circuit with almost no overtaking opportunities is extremely hard to master, and for some drivers winning the Monaco Grand Prix is even more prestigious than winning the World Championship. Return train / coach transfer available. Please call for details. Secteur Roche General Admission – These tickets give you access to a large elevated area overlooking the circuit & harbour. The area is made up of steep hill faces and walkways and can become very crowded in places. This option offers good value for money but is not advisable for those with mobility issues or the more discerning F1 fan. Z1 Standing Area – This is a area of wooden platforms in close proximity to the track. 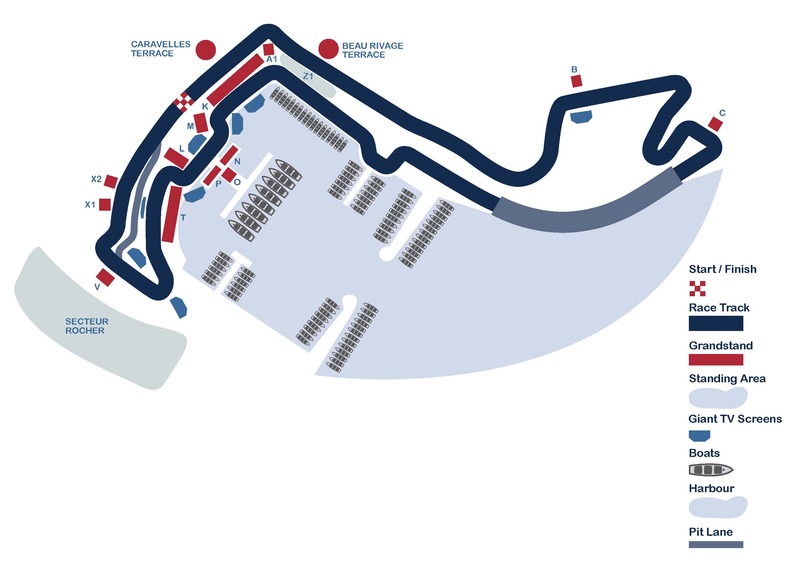 It is located just before the Tabac Corner entry, on the short straight between the Nouvelle Chicane and the Tabac Corner. You will need to be there early to get the best viewing spots. Grandstands X1 – Located behind the pits, this entry level grandstand has an excellent view over the action at the final corner and the start of the finish straight. This grandstand does not have a big screen. Grandstand T Lower – Grandstand T Lower captures a view of the cars as they exit the swimming pool section and head towards La Rascasse. Grandstand K – The largest and most atmospheric grandstand with a great view of the harbour and also extended view of the cars as they travel towards, passed and then away from the grandstand. Grandstand T Upper – Grandstand T Upper captures a view of the cars as they exit the swimming pool section and head towards La Rascasse. This grandstand faces the pit lane so T Upper tickets offer a unique opportunity to also see the pit stops as well as the racing action. Grandstand B – Grandstand B is located opposite the legendary Monte Carlo Casino and offers fabulous views of this as well as the cars passing buy in front. The grandstand features a big TV screen. Beau Rivage Hospitality Terrace – The Beau Rivage building offers the best view onto the part of the circuit where drivers can accelerate to overtake, as well onto the end of the start/finish line, the Sainte-Devote corner, giant screen, the pool, the port and the famous Rascasse corner. Guests will also be able to enjoy the proximity of the prestigious yachts, the buzz of the harbour and the sights of the Old Town of the Principality. This is a true interactive experience, with the cars passing just metres away from the terrace! Also included in this option are a buffet lunch and a complimentary bar on both days. Caravelles Hospitality Terrace – The Caravelles Hospitality option offers a VIP race viewing experience from the balcony of a suite within the Caravelles building. From the balcony you have spectacular views of up to 75% of the race track. Also included in this option is gourmet food and a full day open bar to allow you to experience the Monaco Grand Prix in style. La Rascasse – Rascasse is one of the most famous corners in the world of motor-racing. Watch the action only metres away from the cars and experience the multiple unique views of the action, including looking down into the cockpits from the exclusive viewing areas both inside and outside the building. This tickets offers a unique viewing opportunity to be in the heart of the action located between the F1 pit lane and the Paddock guests and enables a real insight into the teams. After the race watch as the area is turned into the party place to be until the early hours. Available to the public for the first time in years this really is an opportunity not to be missed. Included in this ticket is a light breakfast, full buffet lunch, afternoon snacks and champagne, wines, spirits, beers and other drinks served from 11am to the end of the racing schedule. *Conditions: Prices per person in NZ$, twin share on board basis and ticket category as listed above . 60% non-refundable deposit at the time of booking. Balance due 90 days prior to departure. Balance is subject to exchange rate fluctuations and price is guaranteed only upon receiving full payment. Subject to availability and AIM Holidays T&Cs as listed on our website.